As a 24 year old, first time mother, I felt very alone and in over my head. Being an only child with no babysitting experience, I felt alone in a darkened wood without a compass. In addition, none of my friends had children yet…except one. My oldest and dearest friend, Laura, thank goodness! She was a friend of 20+ years so truly more like a sister to me. As a new mother, I wanted to feel less alone and more confident in what I was doing. It was not practical to think I could phone Laura several times a day. I had to find comfort and confidence on my own. 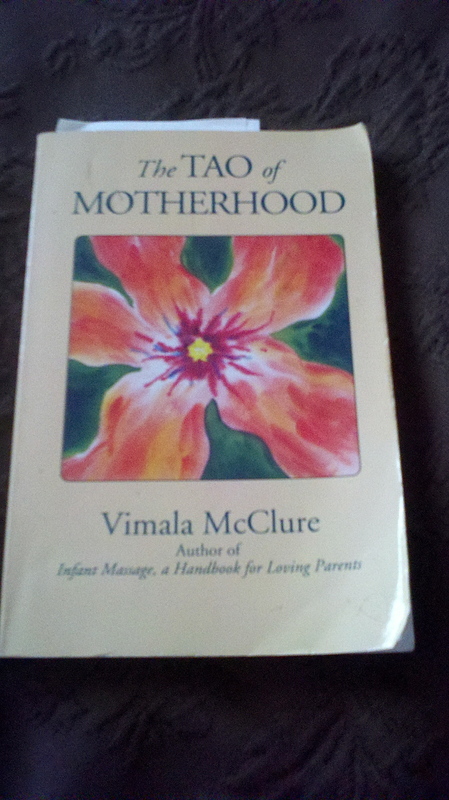 From this need, I discovered the joy, wisdom, and comfort of meditation books on parenting. Over the years, there had been a multitude of daily meditation books on my nightstand ready to help me start my days. Yet, somehow, it had never crossed my mind to look for a parenting book to point me in a positive direction. The first one I found was not a daily meditation book per se, however the entries were short, supportive, insightful and uplifting. The book was The Tao of Motherhood by Vimala McClure. As a spiritual person, by which I mean open to inspiration from any faith, the title caught my eye. I had loved reading The Tao of Pooh in college so what might this have to offer? “A wise mother does not necessarily interfere with her child’s life. Your children have their own processes – their own thoughts, feelings, and reactions – which must be allowed to unfold. If your childhood was painful, you may get overinvolved with your children’s lives and smother them. Or you may find yourself forcing them to think and feel the way you do, to adopt all your values and live the life you wish you had. If you do not trust your children’s process, your children cannot trust anyone or anything. Your confidence in them builds their confidence in themselves. I believe every parent feels alone and overwhelmed at one time of another, some of us more often than others. To find support and connection in the words of another is a simple exercise anyone can do. For me, it’s just another way as assembling ‘the village’ I need to be the best mother I can be for my children.